Theres no other tour quite like Uncle Brian's fun, falls and forest tour, taking you on a fantastic fun filled journey through north Queensland's spectacular Atherton Tableland region. Your adventure will take you over the rolling grassy hills, exploring deep into rainforest gullies and dense eucalyptus mountains. You will enjoy majestic, cascading waterfalls, volcanic craters and interesting bird life of every description, not to forget platypus spotting too! Not only will you enjoy the best scenery in the area, our steady and faithful Gus the Bus will have you laughing, smiling and singing all day long! So bring a day pack and sense of adventure for a day full of fun and laughter from start to finish! Uncle Brian's has been sharing rainforest and waterfall experiences with amazing people for over 21 years and has been locally owned since 1995. The unbeatable combination of music, food and breathtaking natural history guarantees a truly fantastic day tour. Your friendly, funny, expert driver and Gus the bus will be as excited to be on the tour as you will be, they do it because they just love showing off their backyard! They will pick up from your Cairns accommodation at 7:30am where the fun starts. From our own experience, you wont stop smiling and laughing from beginning to end! First stop is Babina Boulders where you will explore exuberant rainforest and the oldest living history museum. Take a short walk, talk, and enjoy a swim in crystal clear mountain waters for one amazing experience. 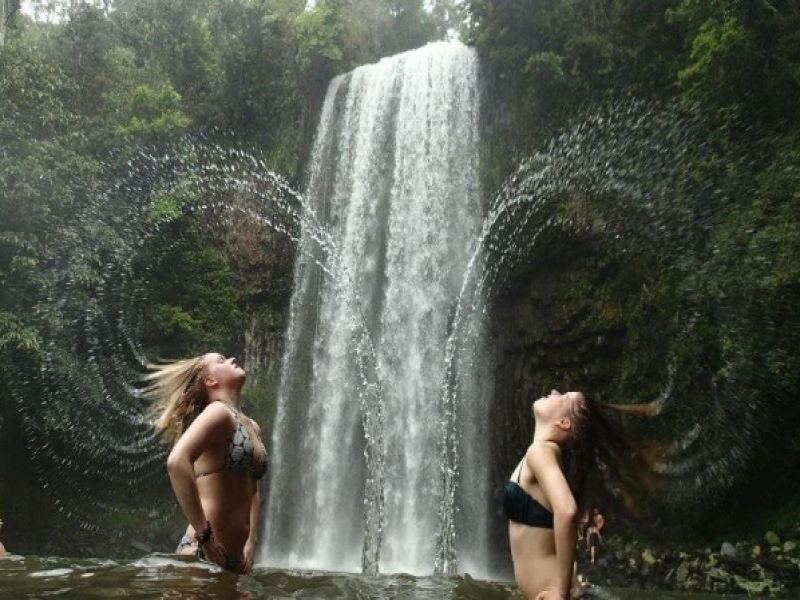 This amazing three stage rainforest waterfall has one of the most awesome swimming holes in Australia! Enjoy a delicious and nutritious lunch at the Tea house - you will not be disappointed. This is the perfect place for a cool dip, with the added bonus of picture-perfect shots and the chance to swim behind the waterfall for a truly amazing time. Enjoy a short walk and relaxing swim at Lake Eacham. This lake is a volcanic crater lake over 60 meters deep and was created by underground pressure that eventually erupted leaving a large crater and now beautiful lake. The last stop of the day is a very special one. Here, you will be looking for a very special creature called a Platypus - one of Australia's icons. Time to head back to your Cairns Accommodation and say goodbye to Gus the Bus and your new found friends, returning at approx 8:30pm. Please note that we do not depart on Sundays.